Cane Fire Film Series presents 'The Breadwinner' at the Acadiana Center for the Arts. Please join us for Science on the Bayou on Wednesday, Sept. 5th for a talk by Dr. Craig McClain on "How the Mysteries of the Deep Seas Challenge Everything We Know About Life." On December 8, 2018, voters in Lafayette Parish will head to polls to vote on a Charter Amendment that would create a Lafayette City Council and a Lafayette Parish Council. Head to Acadiana Center for the Arts for "Coffee With" current members of the Lafayette City-Parish Council. You will have the opportunity to learn more about the Charter Amendment as well as ask the questions needed to be an informed voter. ​Sharing Circle is a monthly symposium on the anthropological, sociological, psychological, and philosophical study of specific topics in various tribal/indigenous, classical polythiestic, neopagan, and intrapersonal spiritualities. ​Sharing Spirits will be a local celebrity driven cocktail event to benefit the work of Catholic Charities of Acadiana, at Rock'n'Bowl de Lafayette. ​Are you considering filing for bankruptcy? Attend this legal seminar for free and learn the difference between Chapter 7 and 13 and have your questions about filing for bankruptcy answered by attorney Jason Senegal. Sickbay is glad to welcome William Matheny to play with Cat Head Biscuit Trio at The Wurst Biergarten. Sickbay presents Hovvdy, Neat, and ~(Squiggle) live at the Blue Moon Saloon! It's going to be a fuzz pop freak rock shred fest! Live Americana, old-time/country music at The Platform in Dat Dog. Sickbay presents noise pop evangelists Tres Oui from Austin and Lafayette's Maintenance live at Rêve Roasters. Basin Arts is excited to present SIDEWAYS HOT TUB: a solo exhibition of new paintings by Jacob Broussard, one of our 4 in house resident artists and gallery coordinator. ​Lafayette Famous features a mix of improvisation and storytelling. In this format, a local celebrity prepares 3 true stories from their life. The improvisers create scenes based on themes from the stories, bringing performers and audience alike on a humorous journey. On Wednesday, March 21, Silverbacks will feature LPSS Middle School Teacher of the Year, Amanda Shackelford! A continuing series of movie nights at Lafayette Public Library showcasing the very best of the worst, from bad acting and horrific plot holes to deeply flawed decision making. This month: A boatload of filmmakers try to survive the perils of a jungle filled with giant snakes and Jon Voight's sneer in Anaconda (1997). All are invited to join Downtown Lafayette and LafayetteKiwanis for a night of family-friendly fun. Lafayette Kiwanis Movies in the Parc will be featuring SOLO: A Star Wars Story. All are invited to join Downtown Lafayette and LafayetteKiwanis for a night of family-friendly fun. LafayetteKiwanis Movies in the Parc will be featuring SOLO: A Star Wars Story. Charity concert honoring Shelbi Nicole Talley with live performances by Kristen Foreman, Clay Cormier & The Highway Boys, Letrainiump, Kylie Frey, The Good Dudes, and an exclusive appearance by Royal Teeth at The Jefferson Street Pub. 100% of the proceeds will go towards Shelbi's outstanding hospital bill. Souled Out stops by recently opened Rock 'n' Bowl de Lafayette on August 3rd! Tickets available now at www.rocknbowl.com. Cité des Arts in downtown Lafayette will present South African musician Moabi Kotu in the Robert D. Sidman Theatre. South Louisiana Songwriters Festival and Workshop (SOLO) is a unique event that combines the intimate, intensive, and creative songwriting process with a public-facing festival. Writers will collaborate for four days, then debut their creations over the next two days of the festival. In addition to playing and singing these works, artists will let the audience in on their processes, thoughts, and inspirations. ​Southern Board Game Festival is an all-day event at the Lafayette Science Museum that will introduce all levels of board game lovers to an expertly curated selection of the most fun and interesting board games from around the world. Head over to Parc International for the 1st Annual SOLA Championships. This is a single day, multi-event two-person team fitness competition. A portion of the proceeds will be donated to D.R.E.A.M foundation of Acadiana. Sign up now to be a part of this amazing experience!!! Sickbay and Southern Screen bring you a special closing concert with Quinton & Miss Pussycat, Molly Burch, Grand Nathaniel & The Ghosts, and Julie Odell at Acadiana Center for the Arts. Southern Screen Festival is an annual event that focuses on various mediums of storytelling. The festival presents four days of film screenings, live music, screenwriting, live podcasts, workshops, parties, and more for every unique individual to enjoy. Every November Southern Screen Festival presents four days of film screenings, live music, screenwriting, live podcast, workshops, parties, and more for every unique individual to enjoy. Southern Screen moves beyond traditional film and music festivals, and works to expose the community to the widespread possibilities of storytelling. This will be the festival’s eighth year and will include film screenings, workshops and seminars, networking opportunities, parties, and other forms of entertainment. Celebrate Spring Break with a FREE DAY at Lafayette Science Museum! Celebrate Spring Break with a FREE DAY at Lafayette Science Museum! Enjoy our awesome exhibits (including Virtual Reality Lab, Augmented Reality, Ocean Giants, The Crawl Space, and Leaving Earth) along with our fully-digital planetarium – all for absolutely FREE! Join us after Patty in the Parc in celebration of one of our favorite holidays, St. Patty's Day! The makers are back at it and this month's meeting will be all about making stamps and stencils for your art! Steam Press Presents 90's Night! Come out to enjoy some 90's themed music while we get you prepared for trivia, karaoke and a costume contest at Steam Press! Be there decked out in your best 90's gear and don't forget, all of these include prizes! 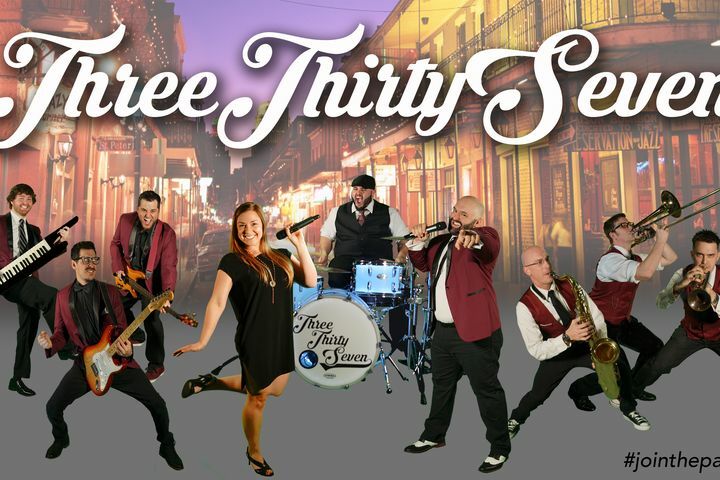 ​Steam Press Coffee Cafe presents Innertrust, Baret Fritz Band, and Gypsy Sticks - three of Acadiana's best rock bands for only a $5 cover! Start 2018 off right with great music, food, and drinks! Steve Riley & The Mamou Playboys + Huval-Fuselier Cajun trio take the stage at The Wurst Biergarten after Festival Acadiens. Come on down to Feed n Seed for a two night outing of traditional cajun and zydeco performance by Steve Riley and The Mamou Playboys! Stillhouse Presents Back to School Bash featuring live music by Ray Boudreaux and DJ Greenlight. There is no cover and drink specials lasting all night! ​Basin Arts and Runaway Dish are teaming up for a unique dance and food performance event, STIR, at the Acadiana Center for the Arts. STIR mixes the senses together for an evening of dance performance taking inspiration from some of life’s basic necessities; food and movement. Expect to taste and see and be moved in a totally new way! ​The Lafayette Storytellers Project at ACA will bring oral storytellers and journalists together to create connections within the community. Making changes in life can be hard, but it’s something we’ve all had to face at some point. To kick off 2018, the Daily Advertiser is hosting a night of stories about fresh starts, whether by choice or by chance – taking that first step, stumbling through the second and not knowing how it will all work out. ​The Lafayette Storytellers Project started with the idea that oral storytelling and journalism are dedicated to the same goals: Serving and reflecting our community and helping each other feel more connected. The more people feel connected to each other – through meaningful and entertaining personal stories – the more they will feel connected to their city and inspired to contribute to making it a better place. Come out and support Ush One See at the brand new Rock N Bowl in the heart of downtown Lafayette. Bowling is option, but food, drinks & good company are guaranteed! All proceeds from this event go to support research for a cure from the vision loss aspect of Usher Syndrome, the world's leading deaf/blind disease in the world. Acting Up (in Acadiana)’s Summer Youth Shakespeare Ensemble Year 16 presents LOVE’S LABOUR’S LOST: filled with music and word-play, the themes include oaths, love, witty manipulation, and more. Students ages 9-senior in high school play all roles and take the stage at Acadiana Center for the Arts just 11 days after they are cast. Missy Dupreast will lead a weekly Sunday Short-Form Ashtanga class at Basin Arts. Ashtanga Yoga is a specialized sequence of yoga postures (asanas) that dynamically links rhythmic breathing and flowing movements. Nashville's Sunset East LIVE at The Wurst Biergarten! SuperCollider: Acadiana’s Improv Showcase brought to you by Silverbacks Improv Theatre! year's event is A Zydeco Dance Fundraiser!! ​Surface is the newest original dance work from Basin Dance Collective, choreographed by Clare Cook in collaboration with body painter, Brittney Pelloquin and abstract painter, Dirk Guidry, and playing at Acadiana Center for the Arts. Surface is an exhibition of work spanning from 2012- 2018, showing my love of material and their playful compositions. After the Rio Parade, Sweet Crude will be playing at Blue Moon Saloon with Radio Zydeco. Indie/folk artist Derrick Savoie and pianist Sweet Willy Allen take the stage at Artmosphere. Join us for an evening of delicious food and great music on Saturday, April 6, 2019, at 6:00 P.M., at the Home 2 Suites by Hilton, at 1909 Kaliste Saloom Road for a fundraiser benefiting Cité des Arts and featuring a performance by Sweet Cecilia. Two national touring artists take the stage at Rock’n’Bowl de Lafayette. Louisiana blues guitarist Tab Benoit with Texas’s country guitarist Dale Watson will make this a night to remember. Take Back the Night is a night to create safe communities & respectful relationships for sexual assault survivors through awareness. This event will be a safe space for survivors, their close family/friends, community leaders and social service professionals. Art teachers are welcome to this art forum at Acadiana Center for the Arts to specifically guide educators about lesson plans. This is a 4-day acrylic painting workshop suggested for teenagers who are interested in a quick exploration in acrylic painting. Basin Arts will have two separate sessions that cover different areas of interest but all work is done in acrylic paint. Television Man transports Lafayette two decades with a night full of new wave music at Artmosphere. For 35 years, two-time GRAMMY award winning artist Terrance Simien, 8th generation Louisiana Creole, has been shattering the myths about what his indigenous Zydeco roots music is and is not. Rock 'n' Bowl de Lafayette is excited to see what it is all about and welcome Terrance Simien & The Zydeco Experience to the stage! ​Uh oh! Dat Dog is proud to welcome Terry & The Zydeco Bad Boys and Curley Taylor & Zydeco Trouble to The Platform! Duson native Terry & The Zydeco Bad Boys will be bringing their funky base lines and choppy old zydeco rhythms to Blue Moon Saloon! ​Join us for our first of many Texas Hold’em Poker tournaments! You are cordially invited to The 5th Annual Rosie Awards! The Riveters are proud to present you with The Rosies! Ever wanted to attend The Emmys, The Oscars, or even The Tonys? Well, we can’t afford to send you to one of those award ceremonies, but we can throw our very own for our community! This is a ceremony for ALL theatre companies all around Acadiana! Join us for the first annual Art of 5K! This race will take place through art-filled downtown and the surrounding neighborhoods of Lafayette, LA. Dress up as your favorite artist (performing/visual) or artwork to help bring the arts to a 5k! The Blue Moon Saloon presents: Rejected Arts Show! On April 6th, the Blue Moon Saloon will be hosting "Rejected Arts Show." The show starts at 8:30 pm with a $5 cover. ​The Breakfast Club Brunch Crawl makes its return to Downtown Lafayette on Saturday, May 12th! be the first production from this up and coming theatre company. DJ RV and Social Entertainment will be leading the crew to our scheduled crawl stop locations. Dat Dog, Rêve Coffee Roasters, The Greenroom, The Wurst Biergarten, Marley's Sports Bar, and The Jefferson Street Pub will be slingin' samples of wicked 90s themed cocktails and old school dishes. We're keepin' it fresh with 90s entertainment and activities along the way! The Full Circle 360, a new community group, is launching in conjunction with the Feel Good Festival at the downtown Lafayette Public Library. The group is centered on the betterment of women and supporting their health, career and community endeavors. ​Dat Dog is happy to welcome The Good Dudes back to the Platform! Get ready to fly UP, UP and AWAY with The Lafayette Children's Carnival. Featuring local superheroes, the LCC joins up with Dat Dog once again to provide a fun filled event. We will be playing games, giving away prizes, and performing acts that celebrate those that protect the world from the forces of evil! "The Last Five Years" will be presented at Cité des Arts on August 10 through 13. Thursday, Friday and Saturday performances at 7:30 p.m. with Saturday and Sunday matinees at 2 p.m. Celebrate the 42nd anniversary of Martin Scorsese’s epic rockumentary of The Band’s legendary send-off performance at Acadiana Center for the Arts. Acadiana All-star ensemble recreates the entire show, song-for-song, with special guests performing the roles of Bob Dylan, Neil Young, Eric Clapton, Joni Mitchell and many more. Something hair-raising is happening at Acadiana Center for the Arts! A family performance of The Legend of Sleepy Hollow will play this Thursday evening. No fall season is complete without the telling of your favorite spooky stories and this retelling of The Legend of Sleepy Hollow is one story you won’t want to miss! Sue Schleifer will lead an interactive writing workshop, free and open to both teens and adults at all writing levels at Acadiana Center for the Arts. If you’d like to attend, please bring along a letter, email or text message. You will use it to develop a poem or a scene for a play. Monday, August 27th | 7:30 p.m. - 9:30 p.m.
A movie screening at ACA by Cane Fire Film Series. From the visionary mind of director Masaaki Yuasa (Mind Game, Adventure Time‘s “Food Chain”) comes The Night is Short, Walk On Girl, a comedy about one epic night in Kyoto. ​The Wurst Biergarten & Lafayette Comedy presents The Office Trivia Night! Due to the overwhelming interest in this event, there will be 2 rounds, with 30 teams each, and one final round. Here is your second chance to participate in The Office Trivia Night at The Wurst Biergarten! Registration is free. The Omni Center Grand Opening will take place May 25th with Alliance Francaise and Bayou Vermilion District. The Progressive Comedy Tour with Graham Elwood and Ron Placone is a night of stand-up, fun and activism at The Wurst Biergarten! Progressives need to come together; an evening of laughter's a good start. ​Acadiana Repertory Theatre presents the second production of their 2018 season, the developmental production of Mark Scharf’s The Quickening. In conjunction with The Registry Visual Installation, The Milena Theatre Group presents THE REGISTRY at Acadiana Center for the Arts. THE REGISTRY theatrical performance asks the question: what happens when a benevolent but authoritarian bureaucracy is in charge of the most unpredictable emotion – love? THE REGISTRY visual installation displays art objects made from fragments of love letters, notes, romance novels, and diary pages. The installation reflects the illusions and disappointments of love internalized by the one in love. The visual installation will be at Acadiana Center for the Arts from December 9th to January 6th. The Revelers & The Daiquiri Queens at Artmosphere! It’s almost Mardi Gras! Come join The Revelers and The Daiquiri Queens at Artmosphere the Friday night before Mardi Gras! The Revelers will be kicking off the show, followed by some of Lafayette’s femmes farouches! The Revelers and Pine Leaf Boys stop by Artmosphere after Festival Acadiens et Creoles. Roots-driven rock band The Revivalists stop by Acadiana Center for the Arts for The Deepest Dream Tour. Lafayette rockers The Shake Backs take the stage at the Blue Moon Saloon alongside Storm and Drive and Julian Primeaux. Get there early to enjoy Happy Hour! This musical is based on The Tale of Custard the Dragon and the Wicked Knight, a poem by Ogden Nash. Join Custard and his friends as they embark on a musical journey in which a most unlikely hero finds true courage. ​Acting Up in Acadiana Presents Shakespeare's 'The Tempest'. The Tempest ponders distinguishing men from monsters, the desire to rule, power relationships, and ultimately surrendering power for the hope of the future. Our concept illuminates the feminine elements of mother earth, as well as the importance of books and intellectualism. Join The Topcats for the very first time at Rock’n’ Bowl de Lafayette. Treat yourself to the best top hits while knocking over some bowling pins. All ages show! The Universe in Music is a unique concept in music event productions for planetarium theaters. The Veterans of Comedy are storming stages across the nation executing Operation 'No Laugh Left Behind'! These proud Veterans not only recount hilarious experiences serving our country, they share tales of marriage, parenting, and general nuance making them relatable to a variety of audiences. Sickbay presents The Viatones and Feverbones at The Platform! Braza Grill Churrasco Catering will be celebrating Mardi Gras Brazilian style with flame-grilled meats, Samba, and cold beer after the Rio Parade at The Wurst Biergarten. Braza Grill will be grilling Brazilian Churrasco and slinging plate lunches (until sold out) at The Wurst Biergarten. Be there on time and come hungry! The Friday Late Night continues September 7th at Central Pizza & Bar. The theme this month is the Beastie Boys! Music by DJ RV, curated to satisfy every B-boy and B-girl. Speed networking and trivia night at Dat Dog! ​Join 705 members for coffee and a round-table discussion of Festival International and its impact on the community with Executive Director Scott Feehan. A new contemporary dance work at Acadiana Center for the Arts examines the forces of desire, creativity, burnout, inspiration, and persistence through the medium of dance and water. Three Thirty Seven will play Rock'n'Bowl Lafayette Friday, August 24th. Benefit concert at The Wurst Biergarten for Thylar Cahanin. Lineup includes Dr. C & the Gris Gris, Smoov Ras & the Reflection, Oh!Kelly, and Sailor Mouth. Be the first to listen to live music at The Pearl! Their soft opening begins with a free pop-up show, so come hangout and break in The Pearl with us. Totally Tuesday at Legends Downtown! Welcome to TOTALLY TUESDAY! Family Friendly until 9pm! Must be 21 to enter after 9pm. -Featuring music by Jones & Hollers! ​A trivia game played LIVE right here, led by our fascinating and entertaining host Nick Bellard of the Hoodcast. Compete with your crew against other teams for fun, prizes, and trivia GLORY! Trivia Night at the French Press! The French Press is hosting a trivia night this Friday! A bistro menu + cocktails will be available throughout the night. Winner receives the money pot! Spend your Friday testing your trivia knowledge at The French Press. Dinner menu will be available! $5 per player, winner takes home the money pot. ​Head to The Greenroom every Wednesday at 8pm to check out the hottest new bar game around! This isn’t Trivia. There are no correct answers. Only opinions. The more popular your answer, the more points you get! Prizes, swag, and bragging rights for the top scoring teams. Troy Richard/Richard Revue After DTA! Troy Richard/Richard Revue performs at ANTLERS after Downtown Alive! The Acadiana Repertory Theatre is thrilled to present the third show of its 2017 season, the developmental production of E.M. Lewis' True Story. ​The Acadiana Repertory Theatre is thrilled to present the third show of its 2017 season, the developmental production of E.M. Lewis' True Story. Enjoy a night of fun, games, food and Trunk or Treating at First United Methodist Church. ​Join the Children's museum of Acadiana for their annual Twinkle Light Night Holiday Celebration! Christmas comes to the Children’s Museum of Acadiana! Twinkle Light Night is filled with hands-on, old fashioned holiday activities for the whole family! Write a letter, visit, and take pictures with Santa. Dat Dog is proud to present, right after Bonaparte parade, an evening with Tx Roc! The Jefferson Street Pub will be hosting their annual Ugly Sweater Christmas Party with drink specials and music by DJ Scoop. UL Lafayette Presents Cajun and Zydeco Night at the Blue Moon Saloon with the McKinley Street Merrymakers, Angelle Aces, and Zydeco Ragin' Steppers. Come on out and show your support for the students, instructors, and the Dr. Tommy Comeaux Endowed Chair in Traditional Music while having a great time. Grammy Award winning jazz drummer, Ulysses Owens Jr. will perform at Acadiana Center for the Arts. Uncle Sam’s Jam, presented by Lafayette Roofing, makes its return as the official Downtown Fourth of July celebration! A portion of the proceeds to benefit the Atchafalaya Swamp Base. We are hosting our first annual 'Valentine's Date Night at Mouton Plantation'. Wine and dine on Bon Temps Grill's gourmet Cajun food and revel in beautiful live music performed by violin player, Cameron Parsons. Dinner will be served at private, 2-person tables. Spice up Valentines Day by solving a murder over the course of an amorous inspired dinner at Esprit de Coeur! Mia Moore Presents: Varietease - Burlesque! Variety! Sideshow! Join us at The Omni Center as Virgil Lemieux takes you on an incredible journey through a land of mystery, excitement and burlesque all through the lens of an old timey variety show! Vermilion Express & Lakeyn Schultz at Artmosphere! UL Lafayette's bluegrass ensemble Vermilion Express will play at Artmosphere with singer/songwriter Lakeyn Shultz opening the show! ​TownFolk is excited to present our 3rd Victory Festival! On Sunday, March 4th from 12 pm - 6 pm, we will have an art show and silent auction, food trucks, kids' activities, beer, and bands! ​A display of tablescapes showcasing the very best talent in Acadiana, reveling in the occasions we all celebrate in South Louisiana. Watch the Acadiana Roller Girls transform into pinup models and take the stage to show off pinup fashion supplied by Lafayette Vintage Bizaar, Karen Blackburn, Ashley Clark, Cherry's Closet, and more! Hair and makeup provided by The Headquarters and Jonathan Fruge & company. Join Big Brothers Big Sisters of Acadiana and learn more about becoming a Big Brother or Big Sister to a child facing adversity in your community. One hour - no commitment! Lafayette Comedy presents "Wait, What? - A Comedy Drinking Game" at The Wurst Biergarten. Wait, What? is a stand-up comedy showcase mixed with a drinking game. Audience drinks when the comics do something on the list! WAITR DAY! A pop-up block party. We're celebrating Waitr's new corporate headquarters in Downtown Lafayette by throwing a pop-up block party! Make plans for Wayne Toups at this year's Le Festival de Mardi Gras a Lafayette March 2, 2019. Bring a team, win some $$GREEN$$!! Half off well drinks and a menu of $5 'dogs all through trivia, too! Affiliated Entertainment presents J. Dugar's What Men do to Women and What Women do to Men at Cité des Arts on Saturday, December 30th and Sunday, December 31st. It's not grandpa's Jitterbug! The WRJ has attitude, hips, and fancy footwork. You'll learn the basics and the latest steps and stylings of this exciting SWLA dance style at Cité des Arts. Michael Seider will be teaching the Whiskey River Jitterbug at Cite des Arts on Friday and Saturday nights! Wednesday April 3rd & Thursday April 4th at 7:00 p.m.
Kidz Performing Arts Company presents Willy Wonka Jr. at Cité des Arts with Friday and Saturday performances at 7:30 pm and Sunday matinees at 2:00 pm. Come see us on Cinco de Mayo (May 5th) and bring ya friends bring ya family and spread the word! Wonderland Performing Arts presents The Best Christmas Pageant Ever! Wonderland Performing Arts presents The Best Christmas Pageant Ever at Cité des Arts. Designed for teachers who have a little playing experience or who have already borrowed the Ukulele Suitcase, this workshop at Acadiana Center for the Arts takes your playing skills beyond the basics and provides time for sharing ideas and songs that work for you in a variety of settings. Retouch your photos like a pro by attending this informative workshop. Learn basic and intermediate retouching techniques that can greatly improve your headshot photography. Participants will learn about several animation forms and have an opportunity for hands-on learning using AOC's Post Lab computers and our new Animation Booth. Learn the basics of recording audio using simple studio tools at AOC Community Media. Learn how to record video and audio in the field at AOC Community Media. In this class we cover basic camera and audio recording operation and beginner techniques. ​Come give our yoga class at the Biergarten a try! The Biergarten is located in the heart of Downtown Lafayette and is family and dog friendly. Each class will offer a slow flow class in the great outdoors at The Wurst Biergarten, with Local Certified Yoga instructor Stacy Barton. Yoga + Beer at The Wurst Biergarten. All levels welcome. Ticket includes a one hour yoga class and a 16 oz drought beer of your choice. Come on out and get sweaty with your fellow Yoga + Beer Lovers! Join Zydeco Mike Humphries for dance lessons each Tuesday night at the Feed N Seed. From beginners to advanced...everyone is welcome. Most months are beginners and rotating into advanced lessons. Cost is $15 per lesson. Just show up! Come be a part of history as we unveil the Inaugural Commemorative Painting for the 32nd Annual Zydeco Extravaganza, created by Bryant Benoit. ​The Kiwanis Club of Acadiana hosts their 18th Annual Zydeco Pancake Breakfast. The breakfast includes “All You Can Eat” pancakes, sausage and beverages with music by Terry and the Zydeco Bad Boys.